This product is available via download only. 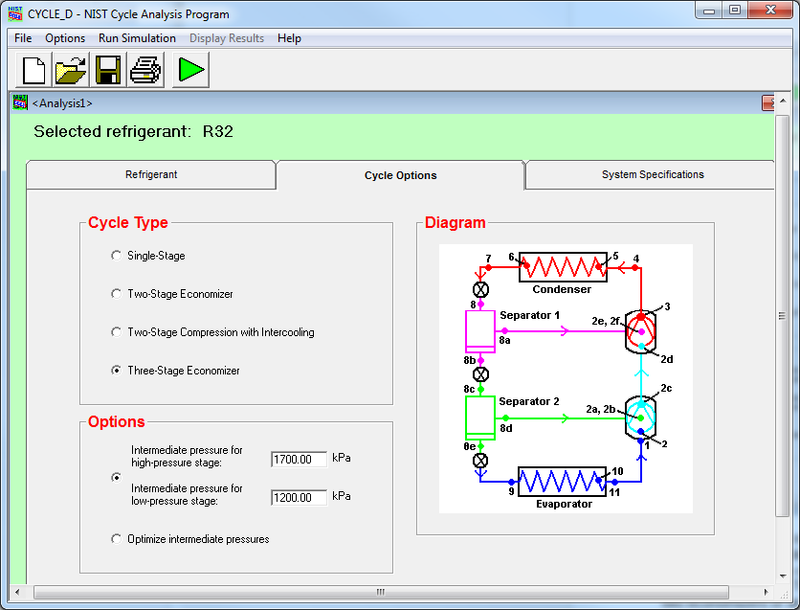 CYCLE_D simulates vapor compression refrigeration cycles that use single-compound refrigerants or refrigerant blends. The model can simulate a basic subcritical or transcritical refrigeration cycle, both with or without a liquid-line/suction-line heat exchanger. In addition, the model can simulate a subcritical two-stage economizer cycle, a subcritical three-stage economizer cycle, and a subcritical two-stage compression cycle with intercooling. CYCLE_D includes 75 single-compound refrigerants and 113 predefined blends. Single-compound fluids can be combined to form blends of up to ten components. Computationally, the program is fully compatible with the NIST Reference Fluid Thermodynamic and Transport Properties - REFPROP, Version 10.0. The basic subcritical or transcritical system simulated by CYCLE_D consists of a compressor, a discharge line, a condenser for the subcritical cycle (a gas cooler for the transcritical cycle), an expansion device, an evaporator, a compressor suction line, and an optional liquid-line/suction-line heat exchanger. The other subcritical cycles may contain a second compressor, and one or two economizers or an intercooler (but do not include the liquid-line/suction-line heat exchanger). The user of the program has to specify the refrigerant and provide operational input data for the above hardware components, except the expansion device, which is modeled as being isenthalpic. The user can also specify the power requirements of the indoor fan, outdoor fan, and control unit of the system. Compared to previous versions, CYCLE_D Version 6.0 uses the representation of thermodynamic properties based on NIST Standard Reference Database 23 - NIST Reference Fluid Thermodynamic and Transport Properties: REFPROP Version 10.0 (versus Version 9.x in CYCLE_D Versions 5.x and Version 8.0 in CYCLE_D Version 4.0). In addition, CYCLE_D Version 6.0 can simulate blends with up to ten components versus five-component blends for previous CYCLE_D versions. Please click here to view the PDF version of User's Guide . System Requirements: Free space for complete installation: 8 MB. CYCLE_D is designed to run on any personal computer (PC) capable of running Microsoft® Windows® 8, 10 or XP with Service Pack 3. The installation module requires .NET Framework 2.0 Service Pack 2 (or later version), which can be downloaded from the Microsoft website if not present on the user’s PC. Keywords: air conditioning; compressor; cooling equipment; equation of state; refrigerants; refrigeration; thermodynamic cycle; vapor compression cycle.